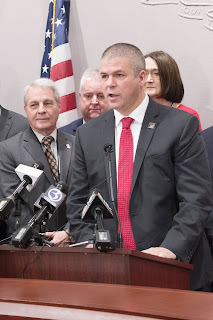 Sen. Len Suzio (at left) on Feb. 17 joined at the State Capitol with a bipartisan group of lawmakers, Connecticut Citizens Defense League President Scott Wilson (at podium) and Second Amendment supporters in speaking out against Gov. Dannel P. Malloy’s proposed fee hikes on pistol permits. “These steep fee hikes would unfairly penalize law-abiding citizens who want to own a gun and may make it unaffordable for low-income Connecticut residents to own a firearm for self-protection,” Suzio said. “I have submitted testimony urging my fellow state lawmakers to reject this ill-advised proposal. I urge residents to contact me with questions on this or any matter at Len.Suzio@cga.ct.gov or at 800 842-1421.” Suzio (www.SenatorSuzio.com) represents Cheshire, Meriden, Middlefield, Middletown, and Rockfall.